Betsy’s mother is a mermaid, her father makes ice-cream, her home is an island. Life is perfect – or is it? Then Mr Glory creates an ice-cream that tastes of wishes. What about an ice-cream that can grant a wish – a wish that could free a princess? But this requires a blue moon – which only happens sometime never. Can the mysterious Mr Tiger help? 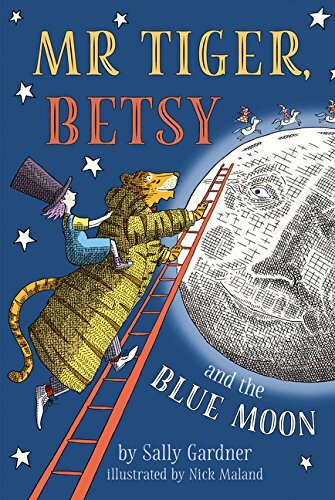 And what giant dangers will Betsy and her friends face to achieve their wish? Sally Gardner can always surprise. In this beautiful little package of a book she delivers a light-hearted adventure that brings to mind such classics as Thurber’s Thirteen Clocks. However the element of the ridiculous is perfectly controlled, and delivered with such confidence that there is no difficulty in accepting a family where the mother is a mermaid who spends most of day in the sea, or ice-cream that can grant wishes. The assured voice of the narrator instantly and effortlessly transports to this world where imagination reigns; vocabulary, simple sentences, dialogue, concise description and above all wonderfully alliterative phrases paint a picture in the mind. Bringing the text to life and adding another dimension are Nik Maland’s quirky, lively illustrations which perfectly compliment and echo the narrator’s tone. Finally the publishers have chosen a very idiosyncratic production, initially surprising, printing the text blue ink on a white ground, white on a blue. However, by ensuring that the text is a clear sans seraph font it is both accessible and fun. What a delight to read.